After an uncomfortable recent past shifting between labels, Californian four-piece Funeral Party released their debut UK record, The Golden Age of Knowhere, in late January 2011. This coincided with a frenetic 15 UK dates in 20 days, closing at Camden Barfly last week, and some breakthrough airplay on XFM, amongst other outlets. A spat with Fearless Records had brewed as Funeral Party resisted a push towards 'punk-pop' but a greater musical freedom with Sony doesn't automatically qualify their sound as 'punk' any more than it is indie or, indeed, 21st century pop. None of which needs to be taken as criticism; breakout tracks 'Finale' and 'NYC Moves to the Sound of LA' are fun, energetic, mosh-pit ready slices of modern punk rock. 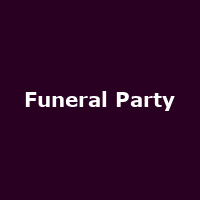 Albums with puns in the title should always be treated with great caution but The Golden Age of Knowhere suggests there may be plenty more to come and, however labelled, there can be no denying that Funeral Party offer vibrant, catchy bursts of west coast punk that will win many new fans. Which is handy, as they've just announced ten new UK dates. The tour kicks off at Glasgow's Oran Mor on 19th May, closing at the Manchester Academy on 1st June. In-between, Funeral Party play London's iconic Heaven (24th May), Cardiff's Millennium Music Hall (28th) and Sheffield's Leadmill (30th), among others. Tickets are on sale now, costing £9.50 for all but the London shows.